An outpouring of grief and anger always follows a deadly mass shooting, said journalists Kevin Sullivan, Tim Craig, and William Wan. 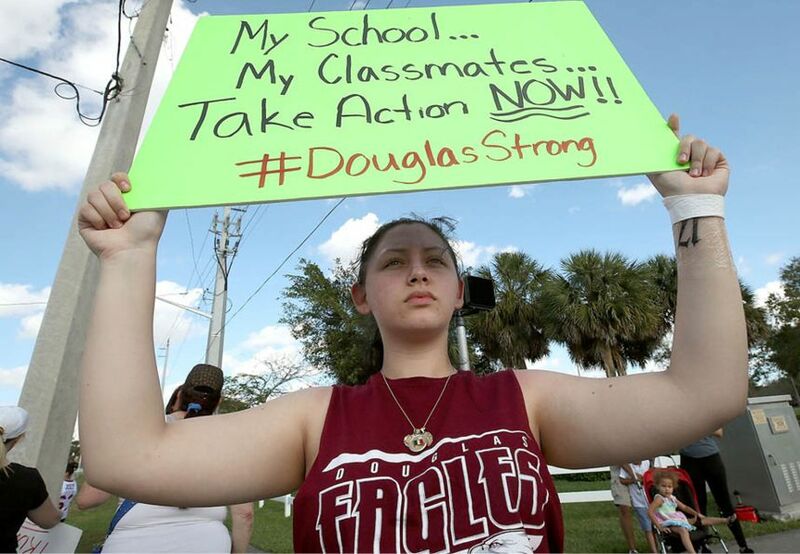 But in Parkland, Fla., students and parents are turning rage into activism. On a day when Parkland began burying its young dead, a dozen people stood on a street corner holding up “More Gun Control” signs as passing drivers honked and shouted in support. This most peaceful and orderly of places has been devastated by the most violent and chaotic of acts. And amid the horse trails, bike paths, and gated communities of a city that prides itself on “country elegance,” the response to a shooting last week that killed 17 people at Marjory Stoneman Douglas High School has been a raw, growing, and furious burst of activism and demand for change. Hundreds of people filled the terrace of the Broward County federal courthouse over the weekend, where their echoing chants of “enough” and “not one more” weren’t solemn—they were seething. None, perhaps, more so than Emma Gonzalez’s. 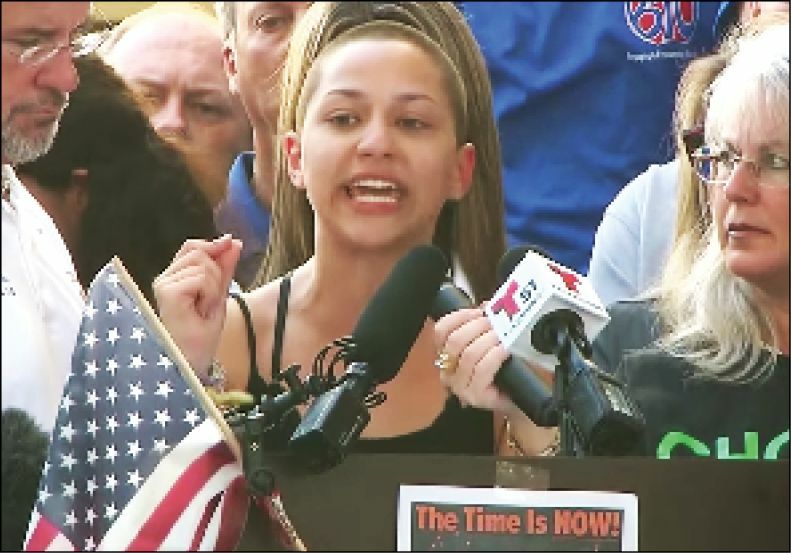 Emma Gonzalez delivered an impassioned speech. In a nearly 10-minute address—her black tank top and tightly cropped haircut barely visible behind podium microphones that stood nearly as tall—Gonzalez slammed by name senators who have proposed softening gun laws. Every few moments, the Stoneman Douglas High senior raised her bracelet-covered right arm to wipe tears from her eyes. In her left hand she clutched her speech, written out by hand on a stack of college-ruled paper. 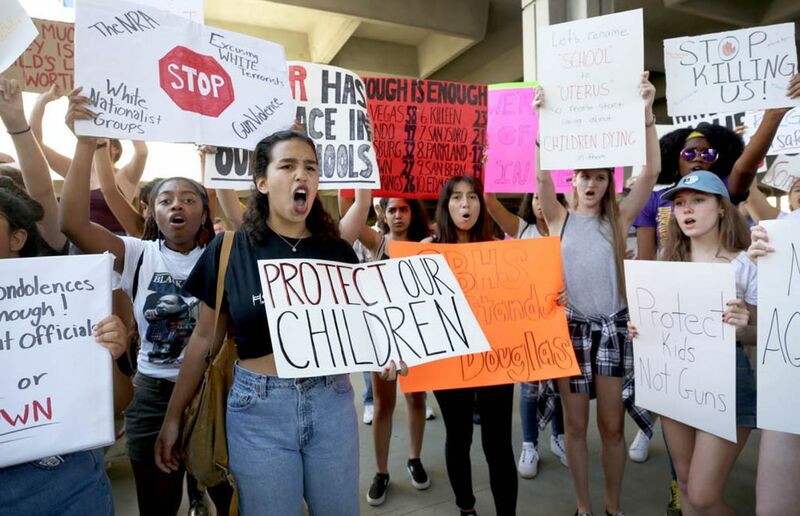 Grace Solomon, a city commissioner who is organizing a large group of parents and students to travel to Tallahassee, the state capital, and then to D.C. to demand “commonsense gun legislation,” said there’s been a palpable shift in the nature of her community. “We’re not a politically charged community—this is new, because we’ve had enough,” Solomon said. Parkland, founded in 1963 on the swampy fringe of the Everglades, has long been a place of gentle ease, with great schools and a well-educated and affluent population of about 32,000 people. It had no stores until the 1990s and still has only four stoplights—including one that just got left-turn arrows in the past couple of months. Its violent-crime rate is a tiny fraction of the statewide rate, and city spokesman Todd DeAngelis said police are more likely to be called for a trespassing alligator than for a murder. Even its politics have a scrupulously fair balance: Although officials said the city, like all of Broward County, tends to lean Democratic, President Donald Trump won one local precinct by 16 points in the 2016 election and narrowly lost four others. But Parkland has responded with a call to activism—angry teachers, parents, and teenagers demanding stricter gun laws, more government money for school security, and better treatment for mental illness. Annabel Claprood, 17, was in Spanish class on Wednesday when she looked down at her phone. It was 2:32 p.m.—the moment, she says, she became a lifelong advocate of gun control and new campus safety laws. At that moment, the shooting started. She took shelter in her classroom and heard every shot. “You should not have a gun at the age of 18,” said Claprood, adding that it makes no sense that at 18 you can buy a gun but not drink alcohol. Ashley Kurth, a culinary-arts teacher at the high school, said her cooking class had just finished deep-frying shrimp when the gunfire began. She quickly locked the doors to her classroom and huddled with 65 students on the floor for two and a half hours until a SWAT team broke a window to rescue them. Less than 24 hours later, Kurth was consoling grieving teachers and students before a vigil at Pine Trails Park, a public recreational facility with turf playing fields, an amphitheater, and high-end playground equipment. Many people arrived on bicycles or golf carts, using the community’s winding network of paved paths. Kurth, 34, said she woke up the morning after the shooting wanting to sever her lifelong ties to the Republican Party.